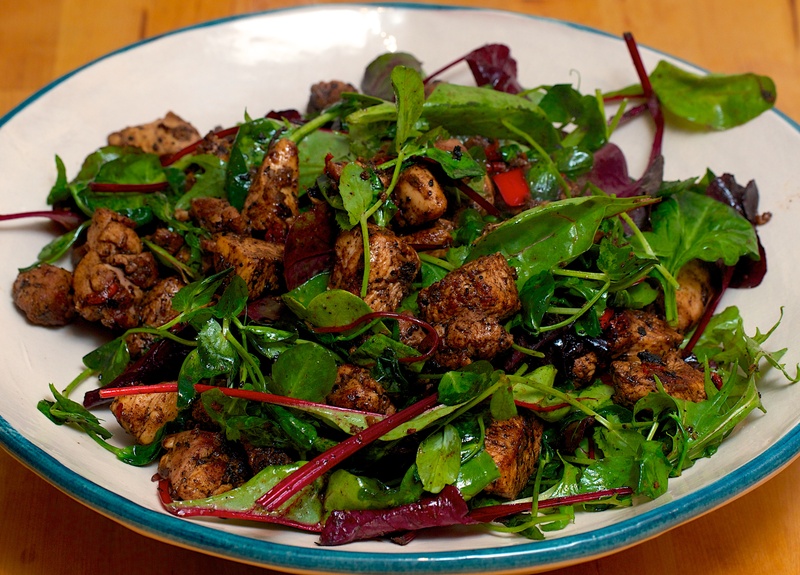 A really quick and tasty dish from Nigel Slater to add a bit of excitement to a pack of chicken thighs. Stir the ginger, chilli and 5-spice powder together in a large bowl. Crush in the garlic, pour in the oil, and mix well. Add the chicken and toss together. Heat a wok to very hot. Add the chicken and dressing and fry over a high heat for 6-7 minutes or until cooked through (put a lid on to ensure the chicken cooks through). Add the sugar, stir-fry for another minute, then add the lime juice and a generous amount of salt. Add the salad leaves to the wok, and toss for a few seconds, or until starting to wilt, then tip everything out onto plates. Nigel suggests scattering with sprouting seeds or cress before serving (we didn’t have any). Wine Suggestion: To balance the 5-spice but not overwhelm the flavours, we’d suggest a New World Pinot Noir from a good area, like California or Oregon. You’ll get lots of juicy fruit and a wine that’s not too heavy for this light dish.